"Come with me where you'll never have to worry about grown up things again." Do our actions define who we are? Read "The Great Rat Hunt" by Laurence Yep and explain the shift in Laurence's relationship with his father. Read "Eleven" by Sandra Cisneros and explain the underlying meaning of words and phrases. Analyze the shifts in tone in the poem "On Turning Ten" by Billy Collins. Compare and contrast Laurence and Rachel's perspective toward growing up. Read and annotate "The Great Rat Hunt" to identify details that relate to Laurence's relationship with his father. Write a paragraph describing how and why Laurence's relationship with his father changes. Read "Eleven" and identify the figurative language and determine the underlying meaning. Read "On Turning Ten" to analyze the subtle shifts in tone. Write an essay comparing and contrasting Laurence and Rachel's perspective toward growing up. Note: You have permission to use my ideas and materials for nonprofit classroom purposes only. The texts below were chosen to explore the challenges of growing up. They transcend cultures and genres: memoir, short story, and poetry. Each year, a different nonfiction passage is substituted, connecting the theme to current events. Essential Question: Why does Laurence's relationship with his father change? Essential Question: What does Rachel's response to her teacher reveal about her character? Essential question: Why does the tone shift in the poem? Meet the authors behind the scenes of this unit. In an attempt to keep my curriculum fresh, I add a nonfiction resource to my units each year. These highly engaging articles from Scholastic Scope, depict youths with the courage and resiliency to overcome the challenges of growing up. I don't stress over teaching a new piece of literature because the teacher resources make it a breeze. Introduce internal character traits to your students by exploring their aspirations -- the type of person they hope to be in the future. The personal connections helps my students to retain the meaning of the words. For a more detailed description of this activity read "Aspirations Balloons Icebreakers" on the Scholastic Top Teacher Blog. This engaging activity was inspired Dave Stuart Jr. in his article "Simple Questions on the First Day of School". You can teach students how to use context clues to determine the meaning of unfamiliar words, or you can create a pre-reading activity. Words student may not know include: barricade, rationalize, wince, perpetual, improvise, reserve, vigilant, ravage, ineptitude, brusquely. Students explore words that can be used to describe Laurence or Father when engaging in group discussions or in their writing. Print the character trait vocabulary cards to use in your classroom. In my Scholastic Top Teaching Blog article "Engage Readers and Increase Comprehension: Annotate Text," I share great tips for teaching students how to write meaningful, insightful annotations. 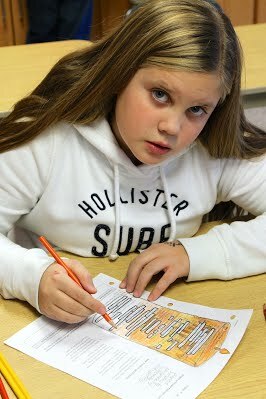 Throughout the unit, students respond to many of the essential questions during writing activities. 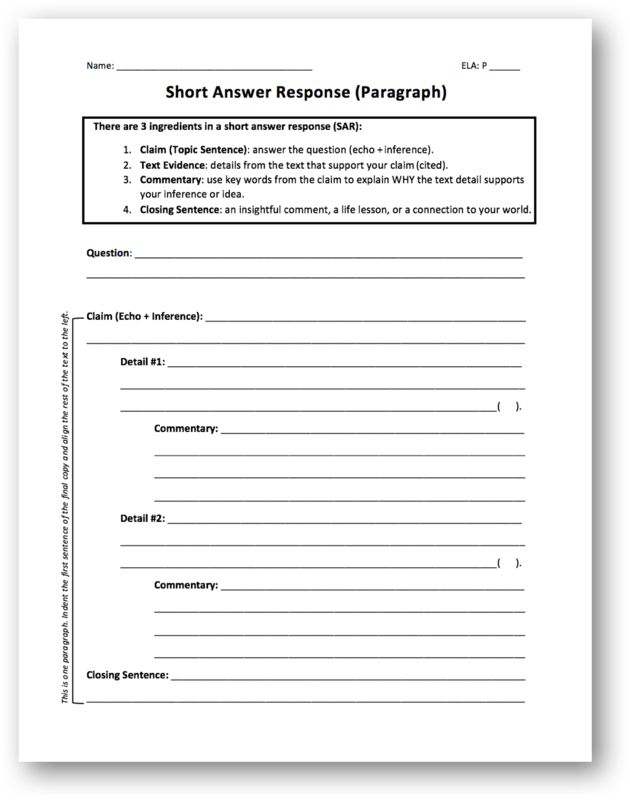 We use the short answer response graphic organizer as a guide when we first start out. Later in the year, the structure of a paragraph become second nature and they don't need it. Write a claim that contains key words (echo) from the question and an inference, a conclusion drawn from the ext or the answer to the question. Use relevant text details to support ideas. Cite all details: paraphrased and direct quotations. Explain the relevancy of details using commentary, connecting the details to key words in the claims. Make an insightful comment that summarizes why the claim is important. perspective toward growing up. The geometric shapes help students to remember the ingredients for the introductory and conclusion paragraphs. For example, the introduction starts with a broad introduction to the topic, a hook. The resources are introduced. Lastly, the topic is narrowed and described in the thesis, the whole point of writing the essay, which is why it is in the point of the upside down triangle. 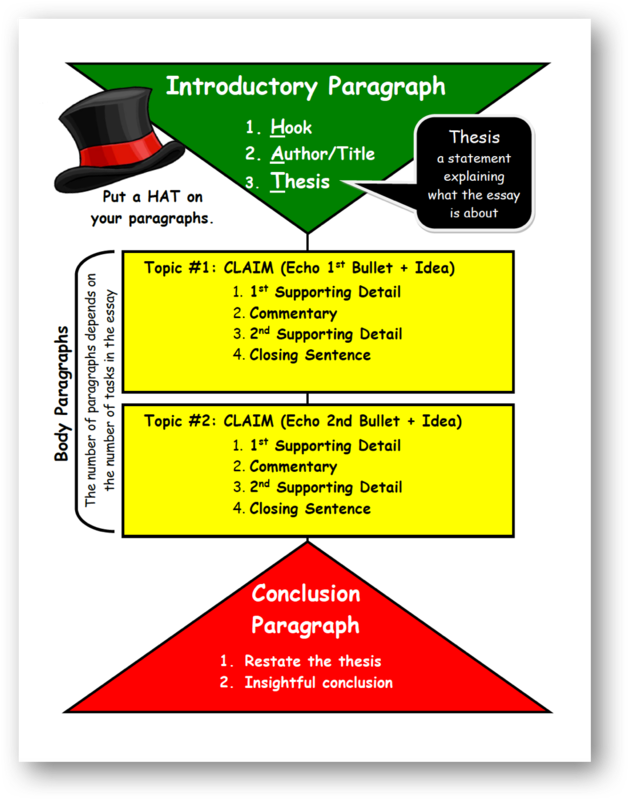 Download, print, and display the classroom poster describing the parts of the essay. "Are You a Loser?" Scope. New York: Scholastic. 2 April. 2012: 16-17. Print. Cisneros, Sandra. ""Eleven." Woman Hollering Creek: and Other Stories. New York: Random House, 1991. Print. Collins, Billy. "On Turning Ten." The Art of Drowning. Pittsburgh: U of Pittsburgh, 1995. Print. Larsen, Elizabeth Foy. "Dying to Be Strong." Scope. New York: Scholastic. 1 Oct. 2013: 4-8. Print. Hutson, Matthew. "What Are You Afraid Of?" Scope 1 Dec. 2013: 16-17. Print. Stuart, Dave. "Simple Questions on the First Day of School to Teach Purpose." Dave Stuart Jr. 7 Aug. 2015. Web. 26 Aug. 2015. <http://www.davestuartjr.com/first-day-of-school-purpose/>. Yep, Laurence. "The Great Rat Hunt." Amy Ehrlich, Ed. When I Was Your Age: Original Stories about Growing up. Cambridge, Mass. : Candlewick, 1996. Print.